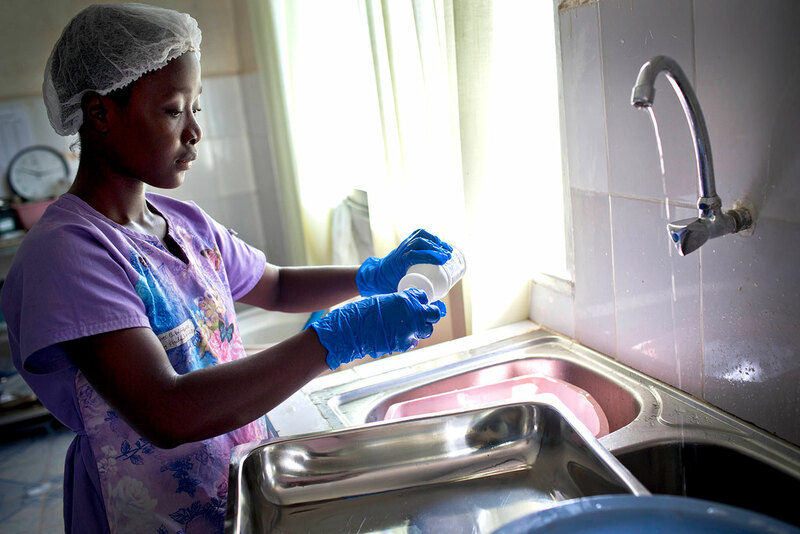 Jhpiego helps countries build their capacity to prevent health care-associated infections. Infection prevention and control aims to protect patients, health care providers and the community from health care-associated infections and increasing antimicrobial resistance, which harm hundreds of millions of patients each year. Jhpiego works with ministries of health to build human capacity in infection prevention and control and to design national policies, guidelines and learning materials. More than 10% of patients who undergo surgery in limited-resource settings develop an infection. As many as 20% of women in Africa who have a caesarean section develop an infection. In developing countries, rates of health care-associated infections in intensive care units can be 3 times as high as rates in the United States. Globally, antimicrobial resistance is a major threat to our ability to treat several common infections. Since 1996, Jhpiego’s technical expertise has expanded to include infection prevention and control, surveillance, outbreak response—including for Ebola virus disease—and strengthening health systems to address antimicrobial resistance. Jhpiego works with ministries of health to integrate infection prevention and control practices, including efforts to prevent antimicrobial resistance, into family planning and reproductive health, maternal and newborn health, cervical cancer prevention and HIV prevention services, including voluntary medical male circumcision. Jhpiego strengthens human capacity for infection prevention and control by developing national guidelines, standards and training materials; training trainers and health care providers in infection prevention and control; and tracking quality improvements. Jhpiego develops national policies and guidelines and reference and learning materials, including Infection Prevention and Control: Reference Manual for Health Care Facilities with Limited Resources and Prevention and Control of Ebola Virus Disease in Health Care Facilities with Limited Resources. World Health Organization (WHO). Health care-associated infections: Fact sheet. Geneva, Switzerland: WHO. http://www.who.int/gpsc/country_work/gpsc_ccisc_fact_sheet_en.pdf. WHO. 2015. How to stop antibiotic resistance? Here’s a WHO prescription. WHO website. http://www.who.int/mediacentre/commentaries/stop-antibiotic-resistance/en/. [November 20]. Bagheri Nejad S, Allegranzi B, Syed SB, Ellis B, Pittet D. 2011. Health-care-associated infection in Africa: a systematic review. Bull World Health Organ. 89(10):757–765. http://www.who.int/bulletin/volumes/89/10/11-088179/en/.